I am delighted to be able to share the details of this amazing event with you all! Some of you will be aware that I have been working with Chris, my personal trainer who works from Elite Performance Fitness. The Gym has joined forces with HOOP (Helping Overcome Obesity Problems) and their Patron, Jessie Pavelka, to put on an informative event about achieving your fitness goals, and how we can work together to help overcome obesity problems. 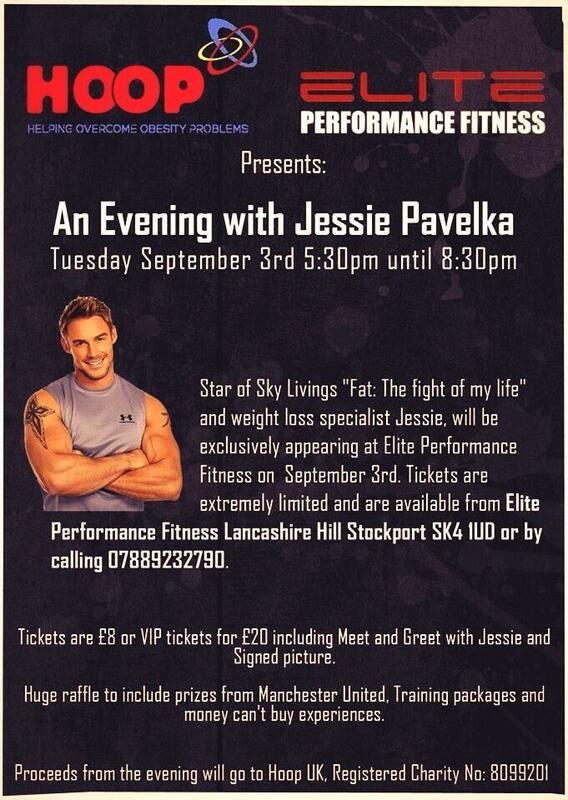 The event will take place on Tuesday 3rd September 2013 from 5.30pm to 8.30pm and will provide attendees with the opportunity to meet Jessie, and listen to talks about how you can make changes and get started on a fitness regime. There will also be other brands and suppliers in attendance, names will be revealed closer to the event date. HOOP are a unique group of passionate people, including professionals, with the common aim to make the changes needed so that all children and adults struggling with obesity are given access to services which are right for them. HOOP is run by people who care and understand. Their aim is to help children and adults achieve a happy and healthy life style. HOOP aim to create the correct environment for all to succeed and offer support every step of the way. For further information about the event, including sponsorship opportunities, please contact Stephanie on 07789 232790.